It’s a treat when I get to fire up my deep fryer. And because I’m a sucker for being influenced by cheesy ads on TV for fast food joints, I had to make a copycat of the popcorn chicken you can get at Popeyes. I couldn’t help myself. I was weak. Crunchy, spicy and addicting, I gobbled them up just like Annie (the lady on the Popeyes commercials) said I would. I figured I needed a few dipping sauces for my copycat Popeyes popcorn chicken. I decided to pick up a few bottles of Sweet Baby Ray’s dipping sauces at the store. SBR makes great BBQ sauces (perfect as-is or as a base for your own creation), so I was pretty darn sure that their dipping sauces would be great too. And they were. Between the popcorn chicken and the dipping sauces and a few fries, it was a happy deep-frying kind of day! Also try my chipotle popcorn chicken bites. Chicken with a kick! Heat 3" of oil to 350 F in a deep fryer or Dutch oven. Combine flour, salt, white and cayenne pepper and paprika in a shallow bowl or pie plate. Whisk together the eggs in a separate shallow bowl or pie plate. Working in batches, dip chicken pieces into the egg. Shake off excess and transfer to the flour mixture, coating well. Shake off excess and place into the hot oil. Fry 3-4 minutes or until golden brown. Transfer to a cooling rack or paper towel-lines plate. 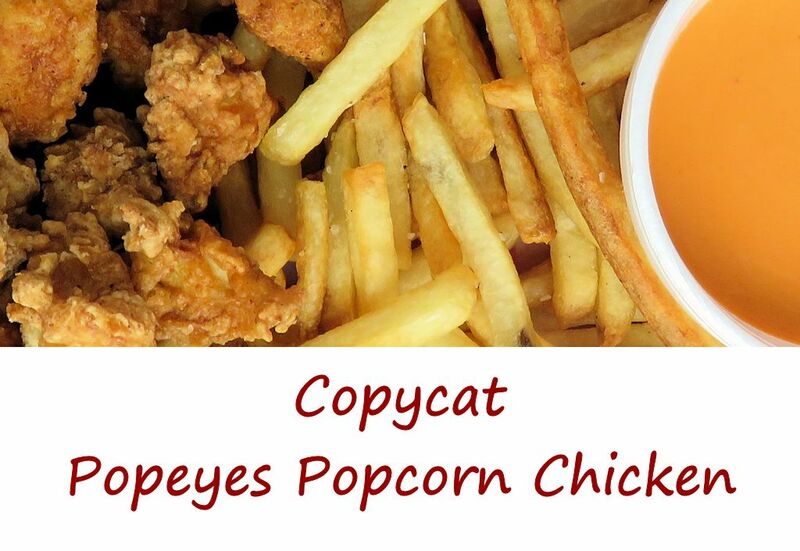 This entry was posted in Copycat Recipes and tagged Copycat Popeyes Popcorn Chicken, recipe by Mike. Bookmark the permalink.